Vibrating hammer selection conditions Permit the use of vibration hammer can reduce the risk of pile damage, but the difficulty in piling where the steel sheet piles hammer selection process is different. It is important to ensure that the piles can be used to overcome soil resistance rather than to convert to heat at the lock port. In some cases, heat can be applied to the pits Melting and bonding. Normally, the environment is the most important concern, but in the hard soil layer hammer piling performance is not easy to predict. If the pile-by-pile method is adopted, the recommended values in the table above must be followed. If the straightness and the penetration rate are difficult to achieve, the screen method should be adopted. Other types of hammers may also be considered. Typically, high-power, high-quality and high-amplitude vibration hammer in the harder to deeper soil layer is more appropriate. If piling with vibrating hammers is used, the dimensions of the sheet pile driver can be determined according to Fig. 1017. The guide can increase the additional thrust to 3 k kN, but this force may still not penetrate thick clay or dense sand. In addition, it is important to note that when a long pile is pierced by a vibration method in a site where it is difficult to piling, a piling resistance is significantly increased if the penetration depth reaches 20 m, unless a hammer is used, otherwise a high-power vibration hammer is required. It must be ensured that the vibratory hammer is able to provide sufficient centrifugal piling force and that the drive can provide sufficient power to ensure that the vibratory hammer operates at maximum output power. Amplitude is also an important parameter when selecting the hammer size, and the minimum amplitude requirement is given. Amplitude = 2000 × eccentric moment (kg.m / dynamic mass (kgo dynamic mass including clamps and piles) Note that the amplitude provided by the manufacturer does not generally take into account the quality of the clamps and piles. (Ie easy, normal or difficult); Step 2: According to the steel sheet piles length and pile section to consider what kind of piling method used: by method: by the root of the pile-up and piling conditions to select the minimum cross-section; Piling or screen-type piling. 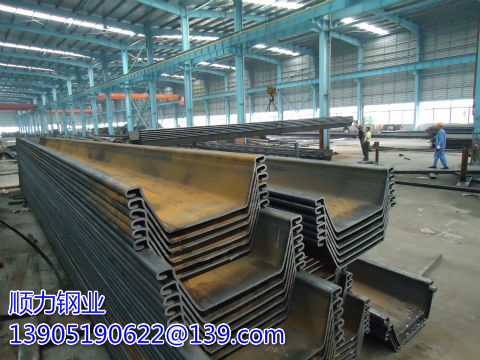 Other Factors Affecting the Selection of Pile Type After determining the appropriate pile type according to the piling performance, the adjustment of the final piling type and grade of the steel plate should take into account the factors listed in the table.